When this floral-patterned shibori yukata caught my eye, I just couldn’t say no. I’ve been collecting vintage clothes my whole life (starting with hand-me-down baby clothes when I was an infant) and as some of you vintage collectors know, there are items that have a marvelous vibe to them, as if the previous owner imparted a lingering sense of joy into the very fiber of the thing itself. 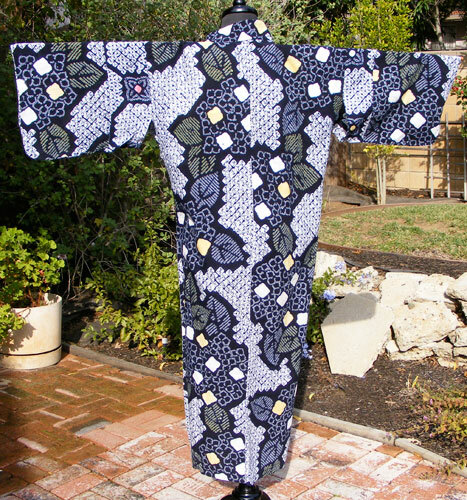 This yukata, or cotton summer kimono, is one of those lovely things. 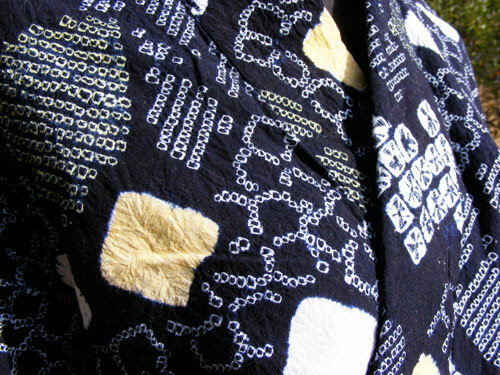 It features a bright floral pattern rendered in various types of shibori (tie dye) techniques and dyed deep indigo blue. The hydrangea design has a bright joyfulness to it and an almost childlike playfulness. It wasn’t until I put it on and looked at myself in the mirror that I noticed an inconsistency in the design. The sleeves just weren’t quite right… and yet they were. Women’s kimono and yukata are meant to be long enough to fold at the waist, but this yukata was too short for that. Usually this corresponds to shorter sleeves as well, but in this case the sleeves fit me just fine. I looked closer and noticed a difference in the design that my eyes had glossed right over when I had excitedly purchased it. At some time in the past, a creative seamstress had added a different shibori fabric to the yukata. This is not entirely unusual for a vintage garment, considering the thrift of previous generations both in Japan and elsewhere in the world, but I’d never seen it done in quite this way before. What struck me most was how clever this seamstress had been in matching up a suitable fabric that would fool the unobservant eye or casual glance. It’s quite likely that both of the shibori pieces were done by the same studio or artist, which would explain how they could mesh so beautifully. 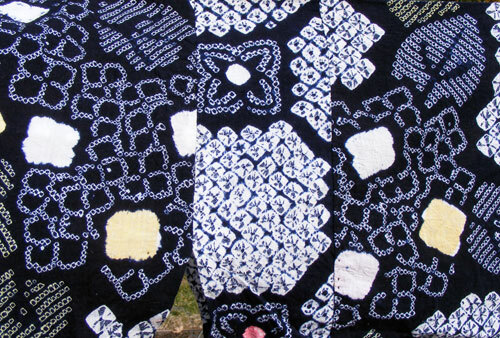 Both exhibit yokobiki kanoko (square ring dots) — or perhaps, tatebiki kanoko (linked dots)? — along with boshi (capped) and bai (shell) designs. Visually, this garment has more going for it than at first glance, and it’s not just to do with the modification. The combination of shibori techniques gives the image some interesting dimensions. What is immediately striking from a distance are the large blocks of bai in white and random squares of boshi in yellow and white. The squared-off shell design of bai almost sparkles a bit, thanks to the fine lines of indigo that peep through. Wow, this is a very clever addition.